Home » Others » Aussie Pro Rhein Gibson,shot 55,16under !! Aussie Pro Rhein Gibson,shot 55,16under !! Rhein Gibson, Australian golf professional, reportedly shot 55 for one round! Rhein Gibson, a 26-year-old former player at Oklahoma Christian University, reportedly shot 16-under 55 Saturday, May 12, at River Oaks Country Club. Such a incredible/unbelievable score! Annika Sorenstam had said many times that her target is 54. He(Rhein Gibson) had almost done it..On the back nine , he shoot 26 (par36). 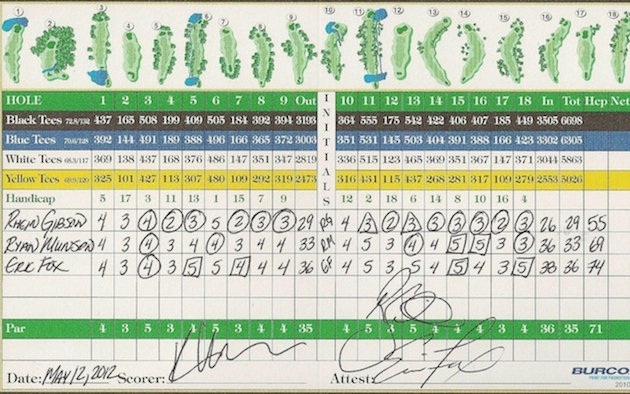 If I'm not mistaken, 26 on the back 9 is new world record as well. Current guiness record : Ryo Ishikawa shot 58 at Cyunichi Crowns (Japan) Golf Tournament 2010.